In defiance of her controlling mother, who has always forbidden her to read anything strange or imaginary, Eliza takes the book. As night sets in Eliza reads one haunting story after another. And the further she journeys inside the book, the more the boundaries of our world and a shadowy land of monsters and forbidden places begin to blur. When the strange, crooked man from the book arrives on the doorstep claiming to be a rare book collector and demanding entry into the house, Eliza’s world is turned upside down. 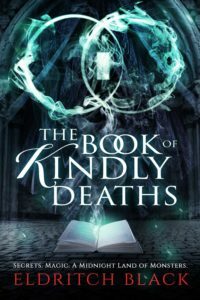 To escape him she must dive all the way into the spine-tingling world of The Book of Kindly Deaths to save her grandfather—and write an end to the nightmare she’s caught inside.